Enemies: the super hero was created with an intention to be a Croatian version of Captain America, during the Croatian war for it's independence from Yugoslavia. Therefore, in the comic, he is fighting Yugoslavian/Serbian army and paramilitary. Powers/Abilities: Super Hrvoje was magically transformed into a stone-man by an ancient statuette of a stone man. Through some ancient magic, whenever the blood of innocents is spilled on an ancient Croatian rocky ground, the statuette will emerge/ be found by someone, and then find it's way to a champion-to-be, someone who is destined to defend the land. 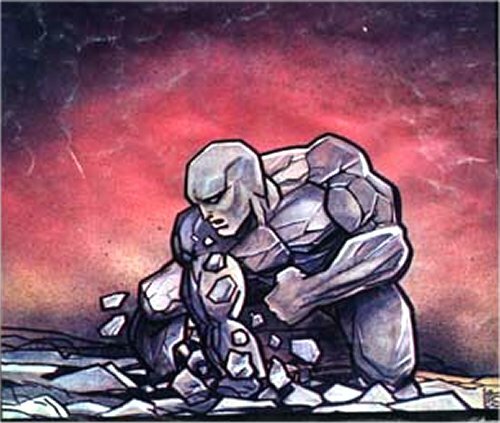 When transformed into the stone man form, rocks cover his entire skin, making Super Hrvoje almost invulnerable. His main offensive power is shooting stones from his hands at supersonic speed. He can also merge with rocks or dive/sink into a rocky ground like into a river to seek cover or to emerge behind his enemies. His weaknesses are that he needs to be in contact with a rocky ground to maintain his powers. Comments: Created by Sinisa Ercegovac. The character's first couple of adventures were co-authored with Croatian comic artist Nikola Listes. Thanks to Romeo Streinger for informing me of this character, and providing the information and images used within. He notes SuperHrvoje first appeared in June 1992, in "Nedjeljna Dalmacija" magazine. 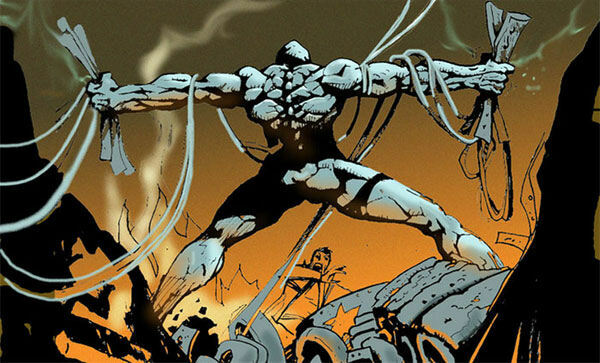 The hero was somewhat influenced by Silver Surfer, and not only in his appearance (he looks somewhat like a rough stone statue of Silver Surfer). The way SuperHrvoje first disables enemy tanks and asks the enemy to leave the country peacefully, and then, when attacked by a deadly force, reluctantly uses his powers to defeat them, reminds the reader a great deal of the Silver Surfer and his similar (futile) attempts to reason with US armed forces who were always attacking him. The comic didn't "fly", however, being that war years here weren't the best time for a new comic. I believe only one sequel was ever published. Hrvoje is a Croatian name derived from the term "Hrvat", meaning a Croat, much like Swedish name Sven is derived from "Svensk" - a Swede. Therefore, his name could loosely be translated as "Super Croat". Sinisa Ercegovac clarifies about the characters' publication history: In 1992 there was an open contest in "Nedjekjna Dalmacija" for the best idea and storyboard for a super-hero. I applied and won the contest. After that I offered Nikola Listes to be co-author and do the inking for first episode but I wasn't too happy with his work so I did it by myself. The first episode was a success and the editors decided to print serial novels so I called Nikola again and offer to work together so that each of us made our own episode. We make two novels: Nikola finished first one and we signed together as authors Nikola Listes and Sinisa Ercegovac. I finished the second novel but the publisher didn't publish it because of financial collapse. Sinisa also kindly supplied the image on the left.